Crystal Fit Home Gym Elliptical Trainer | Do not Buy!!! I really hope you are not checking this review after purchasing this elliptical. When researching for a value for money elliptical, skip this one from your list. I really hope you are not checking this review after purchasing this elliptical. When researching for a value for money elliptical, skip this one from your list. It has a 14” stride length and a 300 lb weight limit on paper. There are built-in wheels for easily transporting the elliptical from room to room, and there are also anti-skid covers for the wheels when the elliptical is in place. Construction is not very strong, the frame wobbles no matter how much you tighten the screw. Most of the reviews in amazon looks fake. The support phone did not pick up any of my calls. The Crystal Fit elliptical trainer is 41″x19″x 63″ and weighs 64 lbs. It has 11 lb flywheels, and the main tube is 66mm in diameter. There are two sets of handlebars with an ergonomic, comfortable design. The pedals are on the larger side at 15.7”x6”. They include a “ribbed dot” design in order to prevent slips and increase the grip for your feet. You can expect to take up to 4+ hours assembling this unit according to the manufacturer. 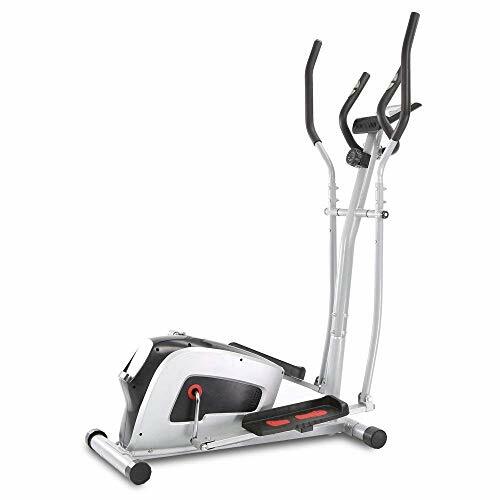 If you like, you can add on “expert assembly” when purchasing this elliptical trainer. A professional will come to your home and assemble the unit per product instructions and remove all packaging to be disposed of for you. As there are many pieces needed for the assembly of this elliptical trainer, detailed instructions are included, and it’s recommended that you read carefully through them and match all pieces to the included pictures and descriptions to ensure everything is installed correctly. The package also includes assembly tools you can use while setting up the elliptical trainer. The display and console include an LCD monitor that displays cycling speed, heart rate, the length of time you’ve been training, distance, and scan. The console has buttons to reset your workout, change the mode, and set your workout specifications. There is also a knob for resistance adjustment. You increase to the right and reduce to the left in order to feel different resistances and work out all your muscles. Crystal Fit offers a 1-year warranty on spare parts and accessories replacement, so if anything breaks or becomes worn down, they’ll send you a new part to replace it with at no extra charge. There is also a 30-day return policy. If there are any issues with the machine, they will exchange it at no cost to you. If you would like to return the machine for reasons other than quality issues, they will issue a refund, but you must pay return shipping.